Washing your hands is one of the best ways to maintain your health. Chances are when you look in the public restroom or breakroom wherever you may be, you will see a soap dispenser that is either a “bulk” soap dispenser or a “sealed” soap dispenser. It stands to reason that if you are washing your hands in a public restroom (whether that restroom is in an office, a classroom, a healthcare facility, a place of worship, a store or some other public venue) that you would expect that your hands would be cleaner after washing them than before washing them. Whether the hand soap was dispensed by a bulk soap dispenser or a sealed soap dispenser. For the most part, you would be correct! But it is important to note that there are some fundamental differences between a bulk soap dispenser and a sealed soap dispensing system which could impact the outcome you can expect with your handwashing experience. Can Bulk Soap Be Contaminated? The sad truth is that soap from bulk soap dispensers is prone to becoming contaminated. According to recent studies, contaminated soap may contribute to the opposite of cleaner hands for those who are using it.Think about it – in order to refill a bulk soap dispenser, the dispenser and the left over soap remaining inside of it are exposed to the environment. Airborne germs, foreign objects, and potential inadvertent hand contact from a janitor who may have just cleaned the toilets can all mix in to the bulk soap dispenser and contribute to possible contamination. Not to mention the more sinister prospect of contamination through intentional vandalism to the bulk soap as it sits in an “open” bulk soap dispenser. This means that not only are the bulk soap dispensers and the soap contained in them potentially contaminated, but hands which are washed with contaminated soap can themselves become contaminated - leaving hands with up to twenty-five times more germs after washing contaminated soap than before. Charles P. Gerba, a professor of microbiology in the University of Arizona's Department of Soil, Water and Environmental Science who led the group of researchers for this AEM research has said he found the soap experiments so disturbing that he now carries hand sanitizer around with him all the time. "I've become rather paranoid about it," he said. Can bulk soap dispensers be cleaned? In other words, once bulk soap dispensers are contaminated, even cleaning and soaking them in bleach doesn’t alleviate the issue. Recontamination can be expected to occur within another two weeks, and contaminants can be present in the bulk soap dispenser even when not obvious or visible. In addition to potentially harboring contaminants, bulk soap dispensers are also more labor-intensive to maintain. It takes time and effort to pour soap from a gallon into each of the dispensers – and the possibility of overfilling and creating a spill are all concerns which need to be considered when evaluating a bulk soap dispenser for your facility. In addition, nozzles can clog or drip which could lead to parts need to be ordered and replaced. Which means that the bulk soap dispenser which may not be performing optimally and is now a potential eye-sore. After reading about the possibilities of contamination referenced in the first part of this article, our hope is that your cleaning and maintenance staff are budgeting time to clean and sanitize the bulk soap dispensers in your facility. We also recommend that they take care not to perpetuate the practice of systematically “topping off” these dispensers with bulk soap over time, making it constantly necessary to perform a thorough cleaning and sanitizing of these potentially contaminated dispensers. So what is the alternative? A sanitary sealed soap dispensing system, like the WAXIE Select™ Foam Handwash System, can help a facility deliver clean hands, all while decreasing labor costs. Time and effort required to pour bulk soap from a gallon container. Added cleanup time required due to messy pour. Refill cartridge snaps in place in seconds. Time and effort required to replace pumps and nozzles. Added cleanup time required due to drips. No-mess cartridge refills snap easily into place, each with a fresh pump and nozzle. Time and effort required to clean and sanitize dispensers periodically. Fresh nozzle with each new refill, with no additional maintenance required. Open dispensers and refill gallons susceptible to vandalism or theft. Lockable dispensers and proprietary refills deter vandalism and theft. Manual overfilling creates spill mess if not immediately cleaned up. Soap is fully contained and dispensed in no-spill cartridges. Permanent nozzles clog over time and cause complaints that soap is out even when dispenser is full. Every refill comes with a new nozzle which prevents clogging. WAXIE Select system also features a large sight window to help eliminate complaints that soap is out. Some dispensers are of unreliable quality and poor appearance. Sleek, stylish dispensers with premium-quality soaps and no-mess cartridge refills. CDC has recognized the bacterial contamination risk of “topping off” refillable bulk soap dispensers and has issued guidelines against this practice. Once contaminated, even cleaning and sanitizing refillable bulk soap dispensers with bleach has been proven ineffective. Studies show that sanitary sealed soap dispensing systems like the WAXIE Select Foam Handwash System offer a very compelling alternative to refillable bulk soap dispensers. 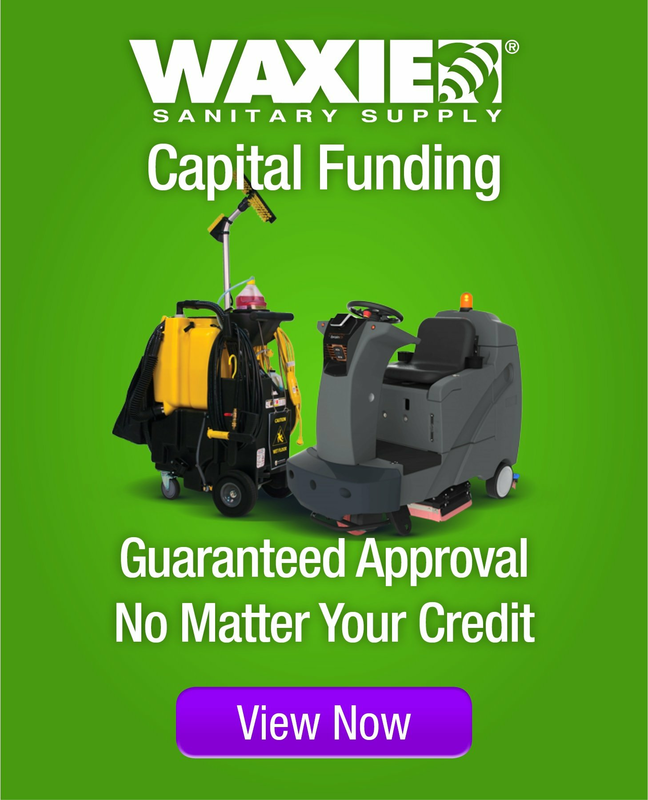 Rest assured that WAXIE will continue to research and develop more effective hand hygiene solutions in order to help to deliver clean hands to every public restroom and breakroom that we can.